Yesterday’s live simulcast of the Metropolitan Opera’s production of Don Giovanni was a thrilling event. One appreciates occasionally the elevation that comes from the marriage of superb singing and exeptional stage acting–as opposed to the razzle dazzle of Rococo stage sets and Hollywood smoke. This Giovanni has a stage set so darkly minimal you are entirely directed to the singers and Lord how they take advantage of Mozart’s orchestral swings: there’s hardly a moment when the push and pull of the old morality play lags or plods. In fact the show has you on the edge of your seat. It is not my intention to write a review. Some days I feel as though I’ve only recently learned how to understand the shiver and vision of art. Some days I want to ask the very weather to forgive me for my primitivism. Watching this version of Mozart’s opera you feel the struggle of commoners to find an ethos and the dignity of human worth. 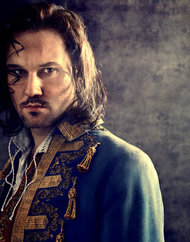 Oh, and Mariusz Kweicien is one hunky DG. These live from the Met broadcasts are repeated at your local theater, so take a look at this–consult the Met’s website for your local listings.